If you are planning a luxury bathroom – whether from scratch or as a remodelling project – then it’s worth considering making a statement of your bath. In any high quality bathroom, the bath is the centrepiece, and so it should be. A bath is such a luxury in our busy modern lives, so if you’re going to create the bathroom of your dreams, what could be more appealing than a stunning feature bath at the centre of your bathroom design? Baths are often placed in corners and against walls to make space for foot traffic and other fixtures, but if you are lucky enough to have the room available it’s well worth positioning your bath in the centre of your bathroom, or at least with free space around it. This gives an amazing visual impact, and far from cluttering the space, this positioning can actually creates a sense of extra space. 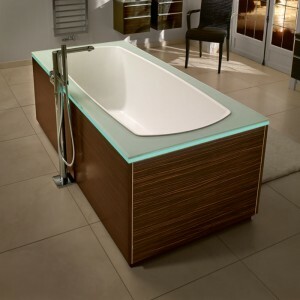 Both modern and traditional styles of bath look fantastic as the centrepiece of your bathroom. Piping and fittings can be hidden so that your bath appears clean and neat in pride of place. If space is lacking you can still highlight your bath by placing it slightly away from a wall in a central position, creating an accent wall behind it using contrasting tiling, glass, natural stone, panelling or even wallpaper. Lighting can play a big part in the aesthetic of your luxury bathroom, and what’s better than a delicately lit relaxing bath? Providing the means for a variety of lighting options allows you to set the mood in your bathroom and draw attention to the fixtures, furnitures and architecture that make your bathroom unique and beautiful. This entry was posted in Luxury Bathrooms, Luxury Interior Design and tagged bathroom design service, exclusive interior design, interior design service, luxury bathroom, luxury bathroom design, luxury baths, luxury interior design, self build luxury design service. Bookmark the permalink.